Ride a shark, defend against zombies, lob yourself via catapult. 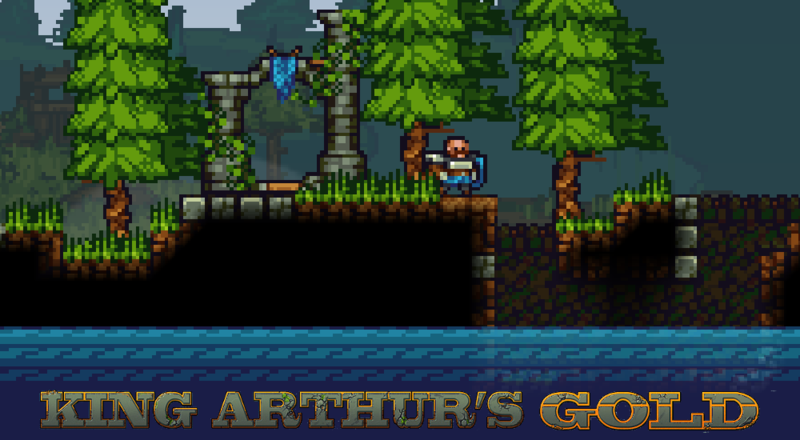 After a lengthy alpha release and nearly 300,000 addicted players, King Arthur's Gold has finally reached beta. It's team-based combat and construction in its most medieval form. King Arthur's Gold combines elements of combat, medieval warfare, team cooperation, building, and even light thievery into a singular online multiplayer experience. Players join games and pick one of two teams, each starting on their own side of the map. Choosing from three character classes (Knight, Archer, and Builder), the goal is to slaughter the other players while seeking out their stash of gold. Whereas the early alpha version was straightforward combat and construction, players can now create all sorts of traps, work with dynamic water and fire, build and operate catapults, boats and battleships, and even ride a shark! KAG isn't all combat and pixel art violence. Because of the character class system, players take on different roles within the team. While the knights are out swinging their swords to hold the front line, archers climb into trees and fire arrows from a distance. Meanwhile, builders are busy fortifying the base in case the offensive line fails, while a group of players are usually attempting a stealth takeover by tunneling through the ground. It's all delightfully chaotic but strangely organized at the same time, especially if you've got a good team that communicates well. All of this happens with surprisingly realistic physics, meaning if you want to build a bridge in the sky, you'd better support it with pillars. You'd also better hope the other team doesn't destroy said pillars. Actual co-op play in King Arthur's Gold is limited to Zombie Fortress mode, a defense-style experience where a team of players battens the hatches and prepares for the nightly zombie invasion. Zombie Fortress hasn't made the transition from KAG classic to KAG beta just yet, but it's on the way. Page created in 0.9221 seconds.